Nonprofit scholars and managers generally recognize that nonprofits need the public’s trust for legitimacy, for effectiveness, and for non-financial as well as financial support. Yet, a complete literature search uncovers no operational or managerial definition of the public’s trust in these organizations. This article offers a conceptualization of the “public trust” that is applicable to nonprofit organizations, touches on what relationship marketing theory says about restoring that trust once corrective action has been taken, and identifies the managerial actions that might impair that trust. It also offers an operational guide in tabular form on the meaning, management, and marketing of the public trust in nonprofit organizations. Promising mission commitment and adherence. These transactions distinguish nonprofits from firms. Breakdowns in these transactions are likely to be significant enough to have meaningful consequences and reverberate throughout the organizational structure. The impact of an impairment of the public’s trust in one or more of these transactions may spill over and impair the trust in the organization as a whole. In the same way, a relationship message to cure the effects of a transactional impairment might have a positive spillover to the organization. Thus, the greatest favorable impact will be achieved when the concepts and messages apply positively to both the transaction and the organization. The properties of the product or service suffering trust impairment. The literature on trust, social capital, and nonprofit or voluntary organizations primarily views the nonprofit as an incubator of trust for its own internal cohesion. 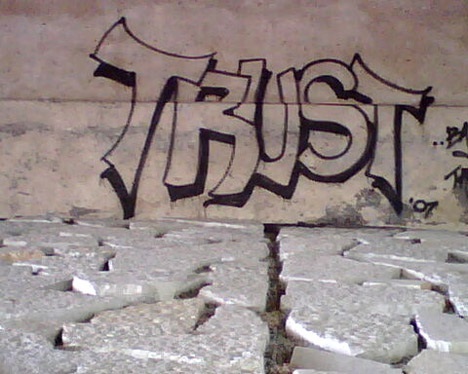 This draws from organizational theory.1 Another approach views the nonprofit as fostering trust for the benefit of civil society.2 The present article examines the nonprofit not as an incubator or creator of trust, but as being functionally dependent upon the public’s trust for fulfilling its mission. This calls for a different logic. In so doing, relationship marketing concepts should be considered. Another way of describing this relationship is principal-agent, where the nonprofit (the agent) serves a public purpose—the public being the principal—in exchange for tax benefits.5 In principal-agent relationships, there is the question of whether the principal (the public) can trust the agent (the nonprofit) to act on its behalf as promised. The operative trusts are trust of specific performance as agreed and custodial trust over the assets the public invested in and which are held by the nonprofit so that it may perform as agreed in its mission. Kenneth Arrow’s concept of trust in nonprofits is grounded in a concept of congruence of interest—A can trust B because A and B have a similar interest, purpose, or orientation.7 Thus, individuals create organizations and become clients to assure that their preferences are attended to and not subordinated. Put another way, the asymmetry in the information between the producer and the client and the need for the client to rely on the producer lead to the creation and perpetuation of a relationship with a nonprofit organization unburdened by profit needs or, as Avner Ben-Ner and Theresa Van Hoomissen note, by the control of outsiders.8 This type of relationship implies a trust based on performance—that is, producing the good containing the particular attributes when the content cannot be readily or reasonably verified by the user. Social capital trust connects to identity trust. A trusts B because A and B share a common identity (and all that implies in terms of goals, norms, values, experiences, and expectations) or because A identifies him- or herself with an organization or purpose that B trusts.14 Therefore, identity trust points to the element of trust in nonprofits that is not necessarily utilitarian or calculating but is what the organization represents as itself. The product of this relationship is its contribution to identity, including prestige, social standing, and identity from affiliation. George Akerlof and Rachel Kranton link identity with the sociological content of an organization and how it projects itself.15 They argue that individuals choose schools congruent with their identities, and schools in turn modify identities to reflect and represent the schools’ sociological content. This implies that the social capital that an organization projects induces the public to enter into certain relationships with it, i.e., become a student or member. 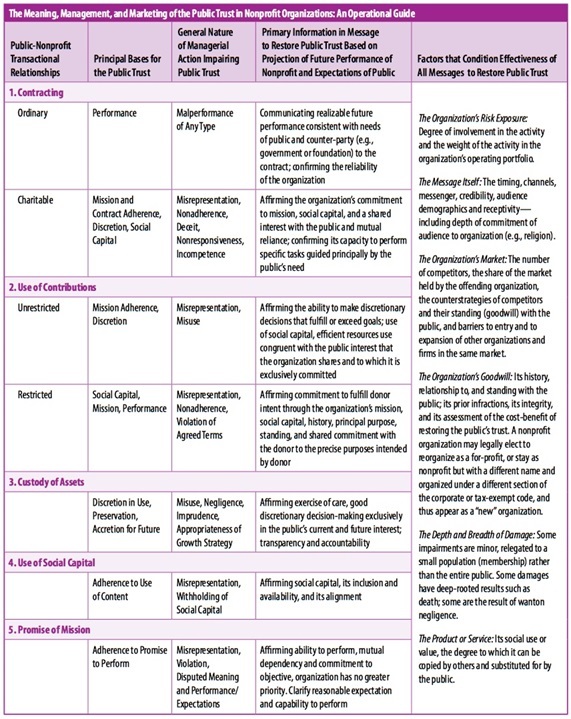 Depending upon the strength of the ties16 and the amount of organizational control, conformity, and personal acculturation,17 individual members incorporate and reflect the organization’s social capital (values, rules, norms, goals) and are transformed into signals (representatives) of the organization’s content. Trust in social capital and its reflection in the identities of those exposed to it take on special relevance for nonprofits that are membership groups—including religious or faith groups and fraternal associations. Their members choose them and their members reflect them. This signals trustworthiness.18 Thus, identity through symbols, mannerisms, names, badges, and uniforms may reflect the underlying social capital and the trust it merits. Trust in a mission derives from a shared interest expressed between the organization’s mission and a public need, unlike a contract in which the interest of one party is compensation and the other is performance. Russell Hardin refers to this as encapsulated trust—A trusts B because B encapsulates A’s needs.19 The public may trust an organization because the organization declares that its exclusive purpose or mission is to serve a need the public wishes served. Several organizations may encapsulate the same mission, but they may use different social capital in doing so. Thus, trust in the mission is conceptually different from trust in the social capital or trust in contracts. Identity trust, incorporated here as a signal of the organization’s social capital. Regina Herzlinger sees the public’s trust in nonprofits as restorable by the quality of information and oversight rendered.22 Richard Petty, John Cacioppo, and David Schumann suggest that the quality of the information (rather than the messenger) may be important.23 The nonprofit literature focuses on the Internal Revenue Service’s Form 990 (which is the annual report of nonprofits analogous in detail and spirit to the Form 10-K of public firms), to which the spirit (but not the letter) of Sarbanes-Oxley has always applied. In their work on relationship marketing, Morgan and Hunt find that enduring relationships are based on a bilateral and utilitarian commitment (each party has a need the other can satisfy and each can rely on the other).24 Thus, relationship marketing implies that the restoration of the public’s trust is facilitated by a demonstrated mutual need and performance reliability valuable to both parties. Further, James Faircloth finds that the responsiveness of the public to marketing messages by nonprofits is influenced by “brand personality,” “brand image,” and “brand awareness.”25 Beverly Venable et al. find that, in charitable giving, integrity is an important aspect of “brand personality.”26 These studies imply that the restorative message of Morgan and Hunt may be strengthened by an organization’s invoking its brand personality (social capital) and its integrity (if any is left after the impairment) in addition to its mission as it encapsulates a need of society. In sum, relationship marketing theory and research imply that a message to restore the public’s trust in the nonprofit through bilateral need and utility (particularly per Morgan and Hunt) may state: why and how the organization serves a continued valuable public need; why the organization needs the support of the public to serve that need; why the public’s trust is needed by the organization to satisfy that public need; and the organization’s capacity, integrity, history, and readiness to meet its promises. A trust relationship is neither unconditional nor risk free.27 It contains the risk and uncertainty that expectations will not always be fully met. Gambetta28 and Niklas Luhmann29 see trust as important when the parties feel at risk, vulnerable, and uncertain—i.e., when one party knows that it is possible to be disappointed by another and that the situation could be avoided but proceeds nevertheless.30 Accordingly, trust is consequential in nontrivial, core transactions subject to risks of impairment. Following are the five core transactional relationships, each containing one or more of the six trusts to which the organization is exposed. A transaction is described, then the types of trusts implicit in it are discussed, followed by the types of managerial actions that could impair the trust, and, finally, by what relationship marketing implies are the concepts to be included in a message to restore the public’s trust. The parties to a contract are frequently in nonequivalent power positions. In performance contracting, the connection between the two parties is based on expectations of specific performance as promised—i.e., trust is connected to performance and expectations.36 Hence, trust may be impaired when an operating unit of the organization fails to perform as it contracted, and the affected cannot be fully compensated for the failure. From this perspective, the nonprofit’s message to restore trust must demonstrate an improved reliability—a capability to meet or exceed the specific needs of the public; and if for some reason it fails, the public can recover its cost. Contracts with strong charitable contents are different from other contracts because the full organizational cost may not be covered even by the contracting party (such as the government, as mandated by state and federal requirements for nonprofit acute care hospitals for the indigent)37—and therefore must be subsidized by other revenues such as gifts and donations; or because prices cannot be charged to those who benefit; or because the outcome is for the public’s welfare. These contracts, as cited earlier, may also be less specified. It follows that the choice of a nonprofit as a contractor is not merely because the contract is unspecified but also because the nonprofit’s social capital and mission are specified and the organization is expected (trusted) to honor them in the contracting relationship. Thus, in social contracting, trust can be impaired by performance below expectations; by performance inconsistent with the mission; by poor discretionary decisions because of being unspecified; and by withholding or misrepresenting the social capital (the values, networks, goals, and norms of the nonprofit) that may have induced the contract relationship. Given the contract performance impairment, a restorative message in an ordinary performance contract based on relationship marketing may emphasize improvements in the ability to perform and meet expectations connected to the specific public needs. However, with a charitable contract, the nonprofit has two audiences—the other party to the contract and the beneficiary public. It needs the former for financial support and the latter for involvement and acceptance. To the latter it needs to emphasize a mutual, encapsulated commitment to its mission and the congruence of its social capital (its brand offering) with the public need. To the other party to the contract it also needs to emphasize its ability and willingness to perform under the contract and to make the right discretionary choices, consistent with the contract terms and objectives. The Financial Accounting Standard Board’s (FASB) Statement of Financial Accounting Standards No. 116 (June 1993) requires that nonprofits distinguish between unrestricted, restricted, and temporarily restricted gifts. This distinction is significant in understanding the public’s trust in nonprofits from the perspective of giving, the ways that trust can be impaired through slight changes in solicitation marketing, and the nature of the restorative message that might apply. This implies that trust in making donations is based (partly at least) on representation—how the organization represents itself to the public in its purpose (mission) and social capital (brand). With a donation, a donor expects no quid pro quo, only the satisfaction that the donation is used for the purpose given.40 With a contract, the motive is to get something specific in return. Hence, the principal in a contract has an incentive to be sure of the organization’s ability to perform and to assess the cost of performance—including the cost of performance failure and the cost of verifying actual performance. In general, a donor does not seek—and the organization may or may not make—a promise of specific performance. The donor relies on a broad promise, has little incentive to check, and often does not. The organization is under no obligation to report details as to how the individual contribution was used. Thus, trust that induces this transaction relies upon the organization’s representation of its purpose (mission) and social capital—the organization’s commitment, beliefs, values, and norms, particularly as communicated through the fundraising solicitations. This trust may be impaired operationally by performance inconsistent with the organization’s mission or social capital—the donor’s inducement for giving. Through the solicitation process, trust impairment may occur because of the misrepresentation of the mission or social capital or specifically by deception. In the case of deception, the issue is not only the impairment of public trust but also the commission of an unlawful act, in which case a restorative message will not suffice. In Madigan v. Telemarketing Associates, Inc., the U.S. Supreme Court affirmed the rights of states to bring action against deceptive fundraising.41 Deception includes misrepresentation of the mission, the purpose of the solicitation, its tax deductibility, the amount that will be used for the program purpose for which solicitation is being made, and the connection between the fundraising agency and the organization for which it is collecting. When donors make a gift, unless they specify a purpose for which the gift is to be used, they are presumed by law and accounting procedures (FASB 116) to be making a gift to the general fund of the organization—i.e., an unrestricted gift. The use of the gift is at management’s discretion. In this case, trust is vested in that discretion. The donor is saying, in effect, “I trust that you will make the best decision about how this donation is to be used in fulfilling your mission, which I support.” This kind of trust is highly permissive. It is impaired by acts such as embezzlement, spending on prohibited purposes such as politics, and unresponsiveness to public needs consistent with the organization’s mission. Thus, the meaning of trust for a donor to the general, unrestricted fund of an organization is based substantially on the confidence that his or her contribution will be used for a general purpose that the organization represents in its mission. “I give to you because you supply blood to the sick, help communities, provide communications between our service people and their families, help the victims of disasters—any disaster—and I want to help in your effort as you see fit.” This is distinctly different from “I give because you represent yourself to be helping the victims of this particular earthquake and I want to help them too.” The first is general-fund, unrestricted giving, and the money is used at the broad discretion of the organization within the scope of its mission. The second is a restricted gift—to the specific event mentioned—and must be treated so legally and in the organization’s accounting statements. In the case of a gift to the general fund, trust is impaired by discretionary decisions that are deemed bad due to misuse of funds or violation of mission or social capital representation by the organization (or its representative). This type of trust is not necessarily built on a forward-looking statement—what the organization plans to do with the donation. The donor is relying mostly (but not necessarily exclusively) on backward-looking statements of what the organization has done in the past. Thus, this kind of trust is based on the organization’s established goodwill, past performance, personality, integrity, and image (brand and social capital). In the case of a restricted gift, the donor states the purposes for which the gift is to be used. The donor may restrict use until some time has elapsed or an event has occurred (a temporary restriction). In either case, the donations are allocated to specific funds for accounting, legal, and operating purposes. The organization’s discretionary powers are confined to these purposes. Trust is impaired by management’s use of the funds for other purposes even if within the organization’s mission. Thus, the more specific the purpose, the more trust depends upon the donor’s confidence that the organization can and will meet the donor’s request—i.e., trust that the organization will perform specifically as promised. This trust is forward looking and relies on foresight. It relies on the ability to anticipate and provide for contingencies. It is impaired by the inability to do so or by going contrary to the donor’s stipulation even if within the mission of the organization or even if foresight was wrong. Permanent restrictions cannot be removed or modified by discretion of management. Only the donor, its representative, or a court through a cy pres decision (one that permits the nonprofit as custodian to vacate a donor restriction) can do so, as explained in Section 413 of the Uniform Trust Code as applied across states. Failing such authorization, the restoration of this kind of public trust may require that the donations be returned with a simple message: “We can’t meet the terms you specify, but we have other use for the money and seek your permission to do so. If you prefer, we shall return the funds.” The restorative message in restricted giving impairment must almost always give the donor (or the donor’s representative) the option to recall the contribution, and appeal to the donor or representative to give the organization the permission to use the funds to fulfill a public need in its mission. Such a message is necessary, but only technically sufficient. Following the Katrina disaster, in 2005, the American Red Cross (ARC) heard objections from the public and from state attorneys general for misdirecting donations given for specific disaster relief in their respective states. During a disaster, nonprofits make appeals for donations. However, many donors do not specify a purpose for which the donations should be directed. Yet, the donor may be presuming to be making a gift restricted to the specific disaster victims. A conflict arises because, by terms of FASB 116 cited above, the organization is not normally required to consider the gift as restricted unless the donor specifies. It has the incentive to consider it a general fund gift because that gives the organization the broadest discretion, including funding a reserve or capacity for the next disaster. Trust is impaired here not by deception but by representation. Compare the messages “give to the ARC to help the Katrina victims” and “give to the Katrina victims by donating to the ARC.” The first is a gift to the organization; the second is a restricted gift to the specific victims. The Internal Revenue Code, Section 1.170A-13, distinguishes these as a gift “for the use of” and a gift “for,” and may treat them differently (as decided in Davis v. United States, 1990). Operationally, giving to the ARC so that it may help Katrina victims implies enabling the ARC through its operating capacity to help the Katrina victims. Operating capacity exists because of previous or future financing; therefore, such a message implies that something less than 100 percent would go to the victims. The second statement implies that the ARC is merely a direct conduit. However, this is an unsustainable position over the long run unless operating capacity is otherwise subsidized. To date, the ARC receives no such subsidy to cover its standing costs, although it receives overhead coverage in individual contracts due to specific events. Even volunteer cost is not zero, since a firm is the recruiter and screener of these ARC volunteers, who must be fed and housed. While other nonprofits respond to disasters voluntarily, the ARC is compelled to do so by terms of its charter, granted by the U.S. Congress in 1900. Under those terms, the ARC—a D.C. nonprofit, tax-exempt under Section 501(c)(3) of the Internal Revenue Code—also became a federal independent agency with specific responsibilities for responding to, anticipating, preparing for, preventing, and minimizing the effects of disasters. To do this, it relies on its portfolio earnings, public contributions, and specific, almost concurrent, disaster contracts with the government. Having a ready infrastructure is not a complete option. As Justices Anthony Scalia and Clarence Thomas opined in Madigan v. Telemarketing Associates, Inc. (an unrelated case), high expenses are not indicators of “break of promise,” because, as they note, donors should expect that part of their donations would go to cover organizational costs. This is what the ARC claims to have done in one case—to have upgraded its system. The ARC experiences exemplify the utility of a relationship marketing message to build public trust in a sustaining relationship that requires quick response (both by the organization and its public supporters) by explaining: its mission; its solicitation and needs for funds for infrastructure and quick response capabilities; the roles it plays in the community and is committed to on behalf of the public in its time of need; why it needs the public support; and the merit of trust in its discretion. Custodial trust is recognized in nonprofit law, governance, and financial management, because all nonprofits are composed of, hold, and operate social assets for the benefit of a group or society.42 The key in custodial trust is the exercise of prudence or care with respect to assets. Those in whom custodial trust is invested are required to make decisions to preserve, accumulate, grow, and make custodial assets available to fulfill a mission when needed. Thus, custodial trust is grounded in the discretionary decision making of management. This discretion naturally tends toward conserving and augmenting, while discretionary contract trust tends toward spending to meet or exceed expectations. Custodial trust can be impaired by imprudence, negligence, lack of due diligence, self-dealing, using the assets for transactions prohibited by the terms of the trust, being reckless, and the wasting of the organization’s assets as described in the Uniform Trust Code of the National Conference of Commissioners on Uniform State Laws, 2005. Custodial trust can also be impaired because management is inactive, incompetent, uninformed, or uninvolved—all reflecting its inability to act prudently. Consequently, restoring custodial trust is usually not sensitive to concepts of existing brand personality, integrity, history, and the like, because the loss of custodial trust is almost always traceable to that which exists or existed. In most states, a dysfunctional management as described can cause an involuntary dissolution of the organization by the state attorney general as provided for in the Corporation Code of California Article 14, Sections 6510–6519. Custodial trust can also be impaired by good intentions, such as imprudently overspending in response to public pressures. Custodial trust can be impaired by disagreements about what constitutes prudence—making the right discretionary choice in discharging custody. In 2002, the Hershey Foundation Trust, which has custody of what was then a $5.9 billion dollar endowment to finance the Milton Hershey School for disadvantaged children, announced that in order to diversify the portfolio and increase its returns it was going to sell its shares of the Hershey Food Corporation—of which it is the largest holder. It got an offer of $12 billion from the William Wrigley Corporation of Chicago. The Pennsylvania State Attorney General and the Hershey community went to court, denouncing the impact of the sale on the community. The Trust withdrew the offer to sell. A relationship-marketing message for restoring custodial trust can communicate: changes in management’s prudence, philosophy, responsiveness, and competence; a discussion as to how the changes may address future public needs by the encapsulation of that need in the nonprofit’s mission; and a reason for trusting the new order—its competence, commitment, integrity, and relevance to the public’s needs and discretionary decision making. This is enhanced by transparency, public involvement, and public accountability. Aside from contracts and contributions, an organization’s social capital may be the basis of a specific transactional relationship, such as recruiting congregants, members, clients, or students. Social capital attracts persons intending to participate in it or benefit from it through the organization’s activities, networks, or products.43 Aside from recruiting, this trust can be impaired when—in negotiating, inviting, or discharging a transaction—the organization’s unit or members misrepresent its social capital, abuse it, or withhold it after it was offered. The July 15, 2006 edition of the Washington Post ran an article by Nate Herpich, called “Kosher Meat Plant Accused of Abuses.” The story, which originally appeared in the newspaper The Forward, is about action being taken by some Jewish religious groups against a Jewish-owned meat processor that was selling meat claimed to be kosher but which allegedly was being processed without the human dignity and animal compassion required to be kosher. Here we see the encapsulation of interest (mission) but the probable violation of the social capital—the norms and objectives of kosher food processing. A message for restoring public trust in the social capital of an organization when it is impaired can include: differentiating the organization from the offender or offending transaction; separating the organization from the event or the person (disassociate, suspend, or expel); and clarifying and affirming the value of the social capital to a public need. Adrian Sargeant and Stephen Lee find that a principal motivation for giving is the congruence between the values of the donor and the mission of the organization.44 Unlike trust in the social capital of an organization, trust derived from the mission is rooted in a promise to perform, not in the content of the performance. The mission is a statement of a broad and more unspecified promise than the specific performance or charitable contract. It describes the broad activity class (analogous to a firm’s Standard Industrial Classification Code) in which the organization agrees to work in exchange for tax exemption, and not the details of what it will do or how. Sharon Oster states that mission statements create bounded expectations.45 Yet, since mission statements are broad to allow adaptation, there is abundant room for misunderstanding.46 The impairment of trust in the mission can come from its violation, disputes over suitability of transactions, or because operations were inconsistent with the promise of a mission. In May 2006, the IRS revoked the tax-exempt status of forty-one credit counselors, claiming they violated a nonprofit purpose. In 2005, Champion County, Illinois, revoked the property tax exemption of a Catholic hospital, claiming that its debt collection policy was too aggressive to fulfill its charitable mission. In 2004, the IRS opened an investigation into the Nature Conservancy because of alleged self-dealing by its directors in the organization’s real estate transactions. Invoking the organization’s image, personality, and recent history could be ineffective in restoring trust impaired by systemic mission violation, because these factors are easily linked to the trust-impairing behavior. The impairment of trust due to the violation of mission may require changes in management, in managerial philosophy, and one or more forms of reorganization, including divestiture. For example, in 2000, the National Association of Securities Dealers (NASD), a nonprofit, sold the NASDAQ (the over-the-counter market quotation system) subsequent to publicity pointing to the potential conflict between owning this operation and the organization’s mission to regulate capital market transactions in the public’s interest. A relationship marketing message to restore the public’s trust in a mission can contain: why the need encapsulated in the mission or the organization is of importance to the public; why and how the new management or organizational form will serve that need; why and how the support and cooperation of the public is important in meeting that goal; why the public should believe that the “new” is more reliable and committed; and the organization’s capacity and readiness to meet its promises through these changes. While relationship marketing concepts can help in restoring trust, one message will not fit all situations. Consequently, managers must tailor them to their specific circumstances. Scholarship has found that commitment is dependent upon trust; corporate image depends upon trust; loyalty to brands (our analogy to social capital) depends upon trust; trust is a principal motivator in rational exchanges; and the credibility of advertising depends upon the credibility of the firm being advertised.47 The syllogistic implication is that trust begets commitment and loyalty. It also begets the motivation to enter, maintain, and accept a message to restore a relationship—implying that trust may be its own antecedent. Thus, organizations that have managed the public trust poorly are less able to call upon it in a restorative message. The success of a restorative message depends upon other antecedents as well. Following are six of these antecedents. While all nonprofits are not equally exposed to core transactions, all have an exposure to the impairment of mission trust, custodial trust, and social capital trust. These are embedded in the very nature of being nonprofit. Organizational structure may also reduce direct exposure. Structure includes independent subsidiaries, affiliates, partnerships (including licensing and leasing arrangements), and operating through management companies in whose names certain transactions are conducted. Shields can occasionally be punctured to the extent that these units act on behalf of, benefit, are directed by, or share the name of the nonprofit, or are identified with it (e.g., athletic booster clubs, auxiliaries, and alumni associations). As Petty, Cacioppo, and Schumann note, the quality of the message matters.49 Also, the effectiveness of any restorative message will depend upon the ability of the audience to identify with the messenger, trust the organization, and believe the message. This is especially so where the impairment demands organic changes in the organization and a credible link between those changes and expected results. Toshio Yamagishi warns against assumptions of audience gullibility in trust relationships.50 The educational level of the audience, the timing, the medium, the frequency of repetition, the depth of the infraction, and the channels used can alter the effectiveness of a restorative message. The effectiveness of a restorative message depends upon the market environment in which the organization operates. The message might be less effective in a zero-sum (or slowly expanding) market where there are no significant barriers to entry—for example, through capital, technology, or licensing requirements, so that the impairment of public trust encourages new providers or invigorates existing ones to capture the disaffected. Hence, the effectiveness also depends upon the counterstrategy of competitors—including a heavy advertising campaign of their own explaining why a relationship with them is more advantageous. The effectiveness of a restorative message is also likely to be affected by the goodwill the organization has with the public. Goodwill arises from a number of factors including location, identification with the public, past history (including past infractions and impairments of the public trust), the social significance and memory of past performance, the reputation and standing of its leadership, and the degree of participation of the public in the decision-making process of the organization. As the public may have a cost of switching, the organization has a cost-benefit comparison of restoration. As noted, restoration often involves organizational and management changes, so the full cost of restoring the public trust includes the cost of these changes. Goodwill, mission, and social capital may justify the cost. To retain its status, the Christian Broadcasting Network (CBN), after twelve years of dispute with the IRS, gave up its tax-exempt status for 1986 and 1987 with a heavy (undisclosed) fine and taxes for politicking.51 Alternatively, CBN could have chosen to convert to a for-profit or close. This case also illustrates the point made earlier, that organizational shields can occasionally be punctured. Three subsidiaries of CBN were deemed to be politicking, but the punishment rose from the transactional level to the parent level. The ability to restore the public trust varies depending upon the consequences of the impairment (such as death or destruction) and its breadth. In 2003, when the head of a D.C. teachers union was convicted of conspiracy and mail fraud (United States of America v. Barbara A. Brook), the impact was contained primarily to members. Their membership and payment of dues continued, notwithstanding the large amount of funds stolen by the director and her staff. However, the 2004 Form 990 annual report of the National Capital Area United Way filed with the Internal Revenue Service showed that public and corporate contributions to it fell in 2001 to 2003, after it was charged with inflating its receipt of donations and its director was charged with stealing its funds. The Washington Post (October 26, 2003) reported that not only did corporate donations fall, but that the new director faced the challenge of restoring public trust. Products may be patented and contain specific properties—which at least in the short run may create dependency mimicking trust. Whether the product is high-valued, a necessity, or a luxury (nonprofit amusement parks) may affect the propensity to receive the message and the importance of restoration of trust. A good may be a necessity, not because it is necessary for life but because it is necessary for other reasons (such as religion) or because of its relationship to other products (such as a shoelace to a shoe). New brands have a harder time competing with older, high-valued, established brands, implying that restoring public trust may be easier for established organizations or products.52 In a multi-product organization, each product may have a different level of responsiveness to a trust-impairing act and to the public response to a restorative message. The table on the following page offers a working guide to managing the public’s trust. Column 1 gives the five core public-nonprofit transactions in which the public’s trust matters. Each of these transactional relationships is within the normal responsibilities of a nonprofit manager and is commonly conducted with the public. The second column shows the specific concepts of trust upon which the transaction depends. The third column shows the various managerial actions that may impair the public’s trust connected to that transaction and also to the organization as a whole. The fourth column shows the key concepts in relationship marketing that may be communicated to the public in trying to restore its trust. Note that these concepts are transaction-specific and do not rest on “admissions, apologies, and plea for forgiveness.” The fifth column shows a generalized list of factors that could condition the effectiveness of any message to restore the public’s trust in the organization. Organizational goodwill, restricted markets, and high-valued nonsubstitutable products or services may allow some nonprofits to get away with mild public rebuke while others cannot. Theoretically—and legally—the public’s trust is central to the purpose and performance of nonprofit organizations. Accordingly, a principal responsibility of all nonprofit management is to strengthen that trust and to restore it if it is impaired by their policies, decisions, actions, omissions, or under their supervision. From a managerial perspective, the public’s trust cannot be an amorphous concept. It must relate to what managers do, can do, and can undo under the circumstances. E. Douglas Creed and Raymond E. Miles, “Trust in Organizations: A Conceptual Framework Linking Organizational Forms, Managerial Philosophies, and the Opportunity Cost of Controls,” in Roderick M. Kramer and Tom R. Tyler, eds., Trust in Organizations: Frontiers of Theory and Research (London: SAGE Publications, 1996), 16–38; Gary Miller, “Why Is Trust Necessary in Organizations? The Moral Hazard of Profit Maximization,” in Karen S. Cook, ed., Trust in Society (New York: Russell Sage Foundation, 2001), 307–30; Boas Shamir and Yael Lapidot, “Trust in Organizational Superiors: Systemic and Collective Considerations,” Organization Studies 24, no. 3 (March 2003): 463–91; and Walter W. Powell and Paul J. DiMaggio, eds., The New Institutionalism in Organizational Analysis (Chicago: University of Chicago Press, 1991). Robert D. Putnam, Making Democracy Work: Civic Traditions in Modern Italy (Princeton, NJ: Princeton University Press, 1993); and Francis Fukiyama, “Social Capital and Development: The Coming Agenda,” SAIS Review 22, no. 1 (Winter/ Spring 2002): 23–28. Piotr Sztompka, Trust: A Sociological Theory (Cambridge, UK: Cambridge University Press, 1999), especially pp. 27–29 and 60–62. Diego Gambetta, “Can We Trust Trust?” in Diego Gambetta, ed., Trust: Making and Breaking Cooperative Relations (Oxford: Basil Blackwell, 1988), 213–37. Herrington J. Bryce, Players in the Public Policy Process: Nonprofits as Social Capital and Agents (New York: Palgrave Macmillan, 2005). Mark Granovetter, “The Impact of Social Structure on Economic Outcomes,” Journal of Economic Perspectives 19, no. 1 (Winter 2005): 33–50. Kenneth J. Arrow, “Uncertainty and the Welfare Economics of Medical Care,” American Economic Review 53, no. 5 (December 1963): 941–73. Avner Ben-Ner and Theresa Van Hoomissen, “Nonprofit Organizations in the Mixed Economy: A Demand and Supply Analysis,” in Avner Ben-Ner and Benedetto Gui, eds., The Nonprofit Sector in the Mixed Economy (Ann Arbor, MI: University of Michigan Press, 1993), 28–58. Mariann Jelinek and Joseph A. Litterer, “Toward A Cognitive Theory of Organizations,” in Chuck Stubbart, James R. Meindl, and Joseph F. Porac, eds., Advances in Managerial Cognition and Organizational Information Processing (Greenwich, CT: JAI Press, 1994), 3–41. Robert D. Putnam, Bowling Alone: The Collapse and Revival of American Community (New York: Simon & Schuster, 2000); and Elinor Ostrom and T. K. Ahn, “Introduction,” in Elinor Ostrom and T. K. Ahn, eds., Foundations of Social Capital (Northampton, MA: Edward Elgar Publishing, 2003). Bryce, Players in the Public Policy Process; and Helen Stride, “An Investigation into the Values Dimensions of Branding: Implications for the Charity Sector,” International Journal of Nonprofit and Voluntary Sector Marketing 11, no. 2 (May 2006): 115–24. Robert M. Morgan and Shelby D. Hunt, “The Commitment-Trust Theory of Relationship Marketing,” Journal of Marketing 58, no. 3 (July 1994): 20–38. James F. Childress II, ed., The Westminster Dictionary of Christian Ethics (Philadelphia: Westminster Press, 1986). I am grateful to Eli Bukspan for this quote. Eli Bukspan, “The Notion of Trust as a Comprehensive Theory of Contract and Corporate Law: A New Approach to the Conception that the Corporation is a Nexus of Contract,” Hastings Business Law Journal 2, no. 1 (Winter 2006): 229–60. Tom R. Tyler, “Why Do People Rely on Others? Social Identity and Social Aspects of Trust,” in Karen S. Cook, ed., Trust in Society, 285–306; and Roderick M. Kramer, Marilynn B. Brewer, and Benjamin A. Hanna, “Collective Trust and Collective Action: The Decision to Trust as a Social Decision,” in Roderick M. Kramer and Tom R. Tyler, eds., Trust in Organizations, 357–89. George A. Akerlof and Rachel E. Kranton, “Identity and the Economics of Organizations,” The Journal of Economic Perspectives 19, no. 1 (Winter 2005): 9–32. Mark S. Granovetter, “The Strength of Weak Ties,” American Journal of Sociology 78, no. 6 (May 1973): 1360–80. James S. Coleman, “Social Capital in the Creation of Human Capital,” American Journal of Sociology 94 (1988): S95–S120. Michael Bacharach and Diego Gambetta, “Trust in Signs,” in Karen S. Cook, ed., Trust in Society, 148–84. Russell Hardin, Trust and Trustworthiness (New York: Russell Sage Foundation, 2002). Dennis B. Arnett, Steve D. German, and Shelby D. Hunt, “The Identity Salience Model of Relationship Marketing Success: The Case of Nonprofit Marketing,” Journal of Marketing 67, no. 2 (April 2003): 89–105. Paul C. Light, Making Nonprofits Work: A Report on the Tides of Nonprofit Management Reform (Washington, DC: Brookings Institution Press, 2000); Betty Jane Richmond, Laurie Mook, and Jack Quarter, “Social Accounting for Nonprofits: Two Models,” Nonprofit Management and Leadership 13, no. 4 (Summer 2003): 308; Elizabeth K. Keating and Peter Frumkin, “Reengineering Nonprofit Financial Accountability: Toward a More Reliable Foundation for Regulation,” Public Administration Review 63, no. 1 (January 2003): 3–15; and Mordecai Lee, “Public Reporting: A Neglected Aspect of Nonprofit Accountability,” Nonprofit Management and Leadership 15, no. 2 (Winter 2004): 169–85. Regina E. Herzlinger, “Effective Oversight: A Guide for Nonprofit Directors,” Harvard Business Review 72, no. 4 (July/August 1994): 52–60. Richard E Petty, John T. Cacioppo, and David Schumann, “Central and Peripheral Routes to Advertising Effectiveness: The Moderating Role of Involvement,” Journal of Consumer Research 10, no. 2 (September 1983): 135–46. James B. Faircloth, “Factors Influencing Nonprofit Resource Provider Support Decisions: Applying the Brand Equity Concept to Nonprofits,” Journal of Marketing Theory and Practice 13/3 (Summer 2005): 1–15. Beverly T. Venable et al., “The Role of Brand Personality in Charitable Giving: An Assessment and Validation,” Journal of the Academy of Marketing Science 33, no. 3 (Summer 2005): 295–312. Niklas Luhmann, “Familiarity, Confidence, Trust: Problems and Alternatives,” in Diego Gambetta, ed., Trust, 94–108. James S. Coleman, Foundations of Social Theory (Cambridge, MA: Belknap Press of Harvard University Press, 1990); Oliver E. Williamson, “Calculativeness, Trust, and Economic Organization,” Journal of Law and Economics 36, no. 1 (April 1993): 453–86; Bryce, Players in the Public Policy Process; and Michael C. Jensen and William H. Meckling, “Theory of the Firm: Managerial Behavior, Agency Costs and Ownership Structure,” Journal of Financial Economics 3, no. 4 (October 1976): 305–60. Paul Arnsberger, “Table 1—Form 990 Returns of Nonprofit Charitable Section 501(c)(3) Organizations: Selected Balance Sheet and Income Statement Items, by Asset Size, Tax Year 2002,” in “Charities and Other Tax-Exempt Organizations, 2002,” Internal Revenue Service Statistics of Income Bulletin, 25 no. 2 (Fall 2005): 266. Charles Fried, Contract as Promise: A Theory of Contractual Obligation (Cambridge, MA: Harvard University Press, 1981); and American Law Institute, Restatement of the Law Second, Contracts (Philadelphia: American Law Institute, 1981), especially Volume 1. Oliver Hart, Andrew Shleifer, and Robert W. Vishny, “The Proper Scope of Government: Theory and an Application to Prisons,” Quarterly Journal of Economics 112, no. 4 (November 1997): 1127–61. Sim B. Sitkin and Nancy L. Roth, “Explaining the Limited Effectiveness of Legalistic ‘Remedies’ for Trust/Distrust,” Organization Science 4, no. 3 (August 1993): 367–92. Bukspan, “The Notion of Trust as a Comprehensive Theory of Contract and Corporate Law,” 231. Herrington J. Bryce, “Capacity Considerations and Community Benefit Expenditures of Nonprofit Hospitals,” Health Care Management Review 26, no. 3 (Summer 2001): 24–39. See also Internal Revenue Service, Rev. Rul. 69-545, 1969-2 C.B. 117, and Rev. Rul. 83-157, 1983-2 C.B. 94. Cagla Okten and Burton A. Weisbrod, “Determinants of Donations in Private Nonprofit Markets,” Journal of Public Economics 75, no. 2 (February 2000): 255–72. Madigan v. Telemarketing Associates, Inc., 538 U.S. 600 (2003). For nonprofit law, see Bruce R. Hopkins, The Law of Tax-Exempt Organizations, 8th ed. (Hoboken, NJ: John Wiley & Sons, 2003). For governance, see Marion R. Fremont-Smith, Governing Nonprofit Organizations: Federal and State Law and Regulations (Cambridge, MA: Belknap Press of Harvard University Press, 2004). For financial management, see Herrington J. Bryce, Financial and Strategic Management for Nonprofit Organizations, 3rd ed. (San Francisco: Jossey-Bass, 2000). Adrian Sargeant and Stephen Lee, “Improving Public Trust in the Voluntary Sector: An Empirical Analysis,” International Journal of Nonprofit and Voluntary Sector Marketing 7, no. 1 (February 2002): 68–83. Sharon M. Oster, Strategic Management for Nonprofit Organizations (New York: Oxford University Press, 1995). Bryce, Players in the Public Policy Process. See Sonia San Martín, Jesús Gutiérrez, and Carmen Camarero, “Trust as the Key to Relational Commitment,” Journal of Relationship Marketing 3, no. 1 (2004): 53–77; Zeynep Gürham-Canli and Rajeev Batra, “When Corporate Image Affects Product Evaluations: The Moderating Role of Perceived Risk,” Journal of Marketing Research 41, no. 2 (May 2004): 197–205; Gary J. Salegna and Stephen A. Goodwin, “Consumer Loyalty to Service Providers: An Integrated Conceptual Model,” Journal of Consumer Satisfaction, Dissatisfaction and Complaining Behavior 18 (2005): 51–67; Clara Agustin and Jagdip Singh, “Curvilinear Effects of Consumer Loyalty Determinants in Relational Exchanges,” Journal of Marketing Research 42, no. 1 (February 2005): 96–108; and Janas Sinclair and Tracy Irani, “Advocacy Advertising for Biotechnology: The Effect of Public Accountability on Corporate Trust and Attitude toward the Ad,” Journal of Advertising 34, no. 3 (2005): 59–73. Toshio Yamagishi, “The Provision of a Sanctioning System as a Public Good,” Journal of Personality and Social Psychology 51, no. 1 (July 1986): 110–16. Sonja Barisic, “Christian Broadcasting Network Settles IRS Case,” Associated Press, March 20, 1998. Chris Pullig, Carolyn J. Simmons, and Richard G. Netemeyer, “Brand Dilution: When Do New Brands Hurt Existing Brands?” Journal of Marketing 70, no. 2 (April 2006): 52–66. Herrington J. Bryce is the Life of Virginia Professor (corporate finance) at the Raymond A. Mason School of Business, College of William and Mary, an affiliate of its Thomas Jefferson Program in Public Policy, and the author of several books on nonprofits, including Financial and Strategic Management for Nonprofit Organizations (De|G Press, 2017), a comprehensive guide to all phases of nonprofit management. When AFH folded, its chapters stepped up to carry the mission forward. Can this newly formed multihub organization maintain its resilience?